The accuracy of crop models is constrained by uncertainty over physiological processes related to climate change. This includes effects of CO2 and temperature on photosynthesis (Crafts-Brandner and Salvucci, 2004) and net crop responses (Long et al., 2006; Tubiello et al., 2007). There also is evidence that CO2 affects crop growth and development through mechanisms besides carbon fixation and transpiration. Elevated CO2 can either accelerate or slow development, depending on the plant species (Reekie et al., 1994; Ellis et al., 1995) and affect plant morphology (Pritchard et al., 1999). 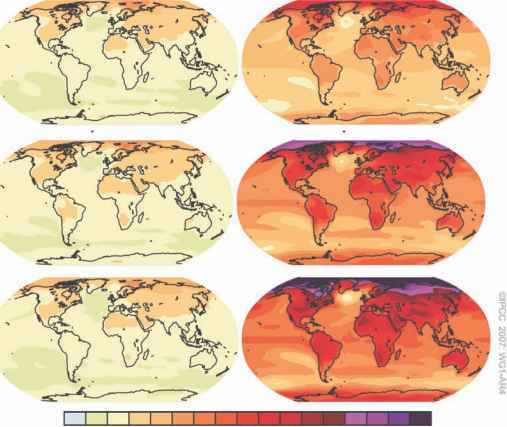 Ignoring whether data for CO2 and climate change scenarios are accurate (see Jarvis, Chapter 2, this volume), basic availability and accuracy of data required for GIS and modelling still pose major constraints. Data limitations exist in several key areas. Soils, crop distributions, land cover and pest/disease distributions would all be good examples. Crop distribution data sets are inaccurate and incomplete even for major crops at the global to regional scale. The combination of crop survey and census data with remote sensing data, to produce grid cell maps with crops allocated into the most suitable areas, is a promising approach (Leff et al., 2004; You and Wood, 2006; You et al., 2009). However, poor quality inputs often limit the utility of outputs in certain areas. These and other data constraints imply that future change scenarios may often be based on imperfect current base scenarios. For simulation models, the list of model inputs in Table 13.2 indicates the dimensions of the task. To accurately describe any production situation, one needs information on management. Ideally, the information should be specified as decision rules, such as for how a producer decides when to plant rather than an average planting date. Standardized formats exist to describe field experiments (Hunt et al., 2001), and integrated crop information systems offer the potential of linking management information with crop genetics (e.g. McLaren et al., 2005). Remote sensing may provide data for crop distributions, yields and production cycles (e.g. Lobell et al., 2003) as well as facilitate high-resolution characterization of soil and weather conditions (e.g. Minasny et al., 2008; NASA, 2009). Development of models and associated software tools remains a largely individualistic process. Hundreds of models have been programmed, but few have survived past their initial publication. Modularization of model components, discussed since at least 1985 (Reynolds and Acock, 1985), should allow researchers to interchange components and focus on science rather than programming. However, there has been minimal progress in establishing modelling frameworks for modules where scientists can readily test hypotheses about specific processes. More recently, computer scientists have argued for use of the Unified Modelling Language (UML) as a way of separating specific scientific hypotheses from actual coding of software (Papajorgji, 2005). Credible studies of crop responses to climate involve dealing with large sets of data and potentially millions of simulations, especially if adaptation is considered. While the computational challenges are daunting, the greater challenge is how to devise efficient protocols for selecting the most meaningful scenarios, interpreting the results, and summarizing outputs for non-specialists. GIS-based mapping has special value for communicating complex data, and use in climate change might be enhanced through animation or dynamic user navigation interfaces.